Series 148 feeders are glass jar dry-diet feeders; they are available in two designs. 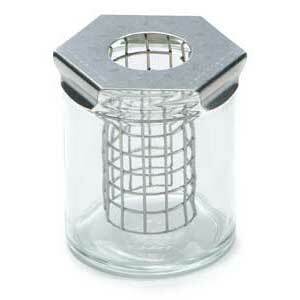 The first is a wire mesh design that consists of a food jar and a stainless steel wire mesh column/lid assembly. The small size is standard; larger size jars are available upon request. The second is our deluxe design that consists of a food jar with a stainless steel snap-on lid, a 7-hole food follower and a retainer spring. For both the standard and deluxe models, a stainless steel spring clip is furnished with each assembly to hold the jar in positive cage position. Series 148 feeders are shipped completely assembled and ready to use.